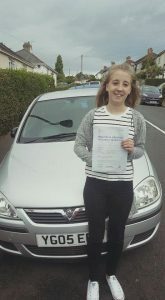 Louise has been having Driving Lessons in Torquay with The Driving School sw and has passed her Driving Test. There were some ups and downs a long the way, so not a first time pass but the experience gained and the hard work that was put in Louise finally made it and passed her Driving Test. Congratulations Louise you did it!! For Driving Lessons in Torquay, Paignton, Brixham and Newton Abbot please call 01803 640607 or visit www.thedrivingschoolsw.co.uk.